Attack on Titan is not content with merely being the most popular manga and anime series on the planet; it’s also jumping into the world of live-action with a movie later this year. But now, it’s also getting a tie-in live action TV show, too! Are we ready for the Attack on Titan Shared Universe? Attack on Titan: The Manga: The Anime: The Movie: The Show (full disclosure, that’s not the actual name) is set to air this August on Japanese streaming service dTV. 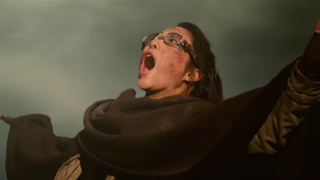 The show will feature the same cast from the movies and focuses on Zoë Hanji (played by Satomi Ishihara), a character from the manga who serves alongside the main cast in the survey corps as well as researching the origins of the monstrous, humanity-chomping Titans. Several other cast members from the movies will appear too, as well as new characters created just for the series. The show will act as a bridge between the two live-action films airing in July and August, telling the story of the everyday lives of the Survey Corps when they’re not flinging themselves around fighting Titans. Helpful, considering there’s probably not much in a TV show budget to have Titans attacking all the time. It’s understandable to see Attack on Titan expanding on its popularity as much as it can through all these myriad adaptations, but all this news probably leaves a sour note in the mouth of anime fans, who are stuck waiting until 2016 for the second season of the hit show.